This one is quite a factory hot rod. Many called them Torino or Fairlane Cobras, which Ford did not. Calling them simply Cobras, however, confuses them with AC sports cars and Shelby Mustangs. Restored-to-factory-stock Ford Cobra fastback with precision balanced and built 428 Cobra Jet FE V-8, close-ratio (very high first gear making the other 3 fairly bunched up) 4-speed and 3.5 rear gear ratio. That combination made for 60 mph+ speed at 6500 rpms in first gear–then there were still three gears left! Also, it was fun to “lug” it by flooring the gas pedal at 60 mph in fourth gear to see how fast the speedo would rise past 100–then when you back off the nose dives because it was pulling so hard from the tons of torque. 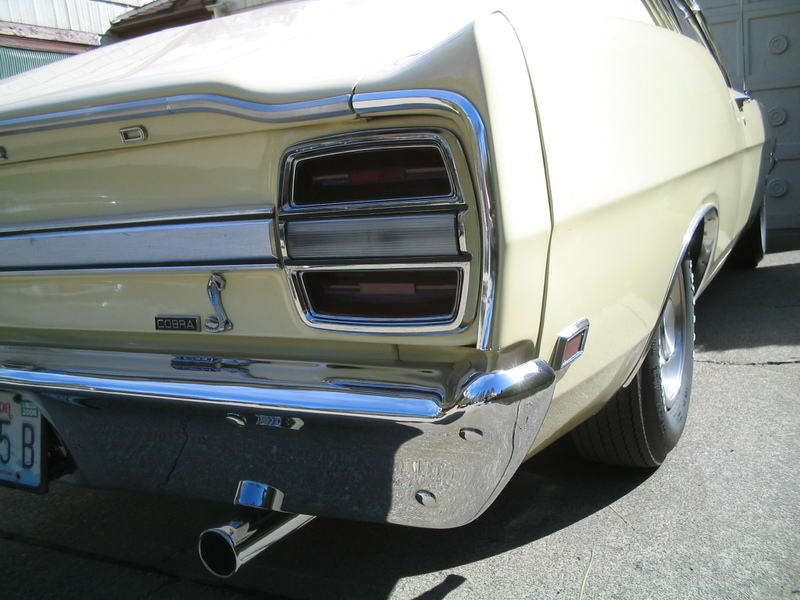 I think I paid 400 bucks each for those FoMoCo exhaust tips–hard to find! Just two tips, bumper chrome, cobra plaque and snake: over $2000!